A major theme that we have tried to address in several of our posts is the idea that virtually all public education reform in the United States adapts to the continuing existence of urban, predominantly minority-filled school districts that have failed for generations. In California and elsewhere, states have taken over individual schools and sometimes entire school districts, but there appears to be an irrational taboo to not even consider dismantling/reconstituting these school districts. It is the very continued existence of these districts in their present form that requires public education reform in the first place. These districts as presently constituted will keep sabotaging any real educational reform that they see as threatening their present interests. Does LAUSD control the reform debate without ever being at the table? With budgets that are often bigger than the cities they serve -- as is the case with the Los Angeles Unified School District and the City of Los Angeles -- these politically influential districts have been able to remain aloof from any discussion of reform that might challenge their continued existence and power, often placing the interests of the businesses that get rich dealing with them over the students they are charged with educating. It's ironic they are not even present at discussions about education reform that they make necessary. Should awareness of racial reality taint reform? While civil rights legislation of the 1960s gave a legal framework by which equality is guaranteed, 400 years of racism has done damage to people of color in our inner cities that cannot be legislated or bused away. I remember hearing past LAUSD Board Member Genethia Hudley Hayes say one time in frustration and disgust, "Black people are tired of auditioning for human being. Give us the $1500 a year we have spent for 3 generations moving Black children from the Crenshaw District and elsewhere to schools like Palisades Charter High School in communities that they will never be able to live in and where they are promptly resegregated into low functioning classes and we will educate our own." In looking at the recent report by Gary Orfield and the UCLA Civil Rights Project, one must take a step back and out of the short-sighted debate as to whether objectively neutral charter school laws are either good or bad, racially segregated or not racially segregated, and ask a more fundamental question: Why are charter schools even necessary in the first place? The answer is that up until now, we have been unwilling to address reforming the structure of inner city school districts. 56 years after Brown, you have the righteous demand for some viable alternative to address the very real concerns of parents, students, teachers, and even some administrators who are not willing to allow students to continue going through these long failed public schools without getting even a minimal education. 1. While examining the statistics that Gary Orfield and the UCLA Civil Rights Project gathered, it is easy to conclude that there is definitely a segregated aspect to the charter school movement, it is only reasonable to ask if this is the same pernicious de jure segregation that existed before the U.S. Supreme Court decided Brown vs. Board of Education? Or is what Orfield talking about a variant that justifies itself for all concerned by the continued existence of the same dysfunctional top-down-factory model schools districts that have existed unresponsive from the 19th century until the present day? 2. While good old-fashioned redneck racism certainly exists, this is not the major factor in the segregated nature of the majority of charter schools. Going back to Brown, legislating integration in 1954 did nothing to end segregation in this country -- there still remains more de facto segregated in 2010 than de jure in 1954. In fact the Supreme Court had to come back a year later in 1955 to try and force integration with busing, which was thwarted by White flight to the suburbs or private and parochial schools (Swann v. Charlotte-Mecklenburg Board of Education). Now, it is not just the Whites that want out of long-failed public schools, it is Latinos and Blacks, who are no longer willing to wait for districts like LAUSD to give their children the equal education that Brown mandated as the law of the land. If one goes back to the Bronx, New York in the 1960s, one finds that the Whites were not alone in their desire to escape. Black Muslim schools there and in other predominantly Black communities in large cities self-segregated themselves into great schools to avoid the irreparable damage that public schools were doing to their children. 3. Segregation in both women's colleges and grade schools was first attacked after the 1960s women's liberation movement until people realized that women often do much better in an environment free from the distraction and harassment of boys, not to mention teachers -- who often favor their male students. Can interim segregation finally make integration a reality? While it is clear to me that Blacks and Latinos are not inherently inferior as was the not so subliminal message in the media and elsewhere when I was growing up in LAUSD schools of the 1950s, years of racism and awful schools have created an ignorant inner city population whose needs nobody -- White, Black, Latino, etc. -- seems willing to address in a timely, systematic, appropriate and pragmatic basis. Does anybody really believe that big city school districts can change? The failed public education bureaucracies in this country continue to survive, because they just want one more year -- or at least a few more until they can make it to retirement. The masters of this system have failed to see the disastrous effects of pushing such a huge portion of our population through school without basic skills. This will also have an incredibly negative effect on their lives too, whether or not they put their own children into private schools. There is a tacit racist rational that is used to maintain the failed status-quo in public education. This is the belief by all concerned that minority children cannot learn and need to be sheltered -- the reform model in Harlem proves otherwise. 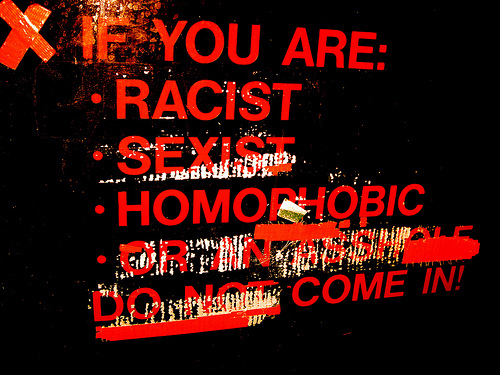 There is a certain irony to the fact that in one sense, the least racist organization within its own culture is big city public school districts like LAUSD, because they have discovered the critically important fact that still seems to elude too many others in this country: Human greed is a far stronger emotion than racial hatred, especially if you co-opt once disadvantaged, but now somewhat educated, minority administrators to do the dirty work of continuing to sell out people in a system that they are smart enough to know doesn't work. You give a minority LAUSD administrator a six-figure salary with all sorts of perks and they will do things that would cause a riot if White folks still did them on their own. Isn't opportunity a wonderful thing? Thee is much truth here. Most of these poor performing schools are run by the very minorities they claim to help. Black kids in particular are victimized by black administrators with low expectations and eager to not rock the boat. Many try hard to return disruptive discipline cases to class with no consequences - ensuring a poor learning environment for all. Why? Keep the numbers right. Hiring and promoting based on cronyism is rampant, as is incompetence this brings. esson for us all? The problems you describe are in muslem societies as well. Difference here is it's published.